You have some gorgeous quilts here! Thanks for the chance to win some fabrics! Wow, your quilts are fantastic! The graphic designs, the colors, the quilting, oh my! So glad the blog hop led me to your blog. Love the giveaway fabrics, thanks for the chance to win. So glad to meet you through the Blogathon. Lovey work! Thanks for the generous chance to win some fabric! And now I'm off to meet some new to me bloggers too! Thanks for sharing your quilts with us. I love all your quilts! The colors and graphic modern style really appeal to me as do your fabric choices. Nice to meet you. Also, I really like the last full size quilt you show hanging with the reds, golds, blues. Is there a pattern? I love the black and yellow one, awesome! textures you have added by just the stitching. Your Quilts have my fingers itching to go and start another project, crazy the more projects I start, the better I feel! The colors remind me of a bright raindbow! Love seeing the photo parade - you do beautiful work! Your work is so beautiful, Andrea! I'm in awe of your quilting skills - totally gorgeous. Longarm quilting is something I've wanted to try and now I'm even more inspired to do so. How cool to discover we live in the same city! Thank you for sharing your amazing talent with us. That is a lovely selection of quilts, Andrea! And you are definitely creating your own stitching style! You are rockin’ the longarm! I am so enjoying this Blogathon...your work is lovely! fantastic quilts, thank-you for sharing them! Hi! Hopped on over from Katherine's blog. Your work is beautiful as is your blog! And i LOVE the fabrics you chose for the giveaway. Right up my allie! I enjoyed meeting you, Andrea, and I really like your projects. I'd really like to win your fab giveaway, too .. thanks for the chance. Wow! Your quilts are so beautiful! The fabric is pretty too...thanks for the chance to win. Love the quilts. Your work is amazing. Will love to follow you and thanks for having such a great give away. Absolutely love your quilts, I too really like straight lines. Such lovely fabric in the giveaway! I am so impressed with your long arm "doodling", something I still struggle with. Great work and thanks for sharing. Thanks for sharing your wonderful quilts - and the beautiful quilting too. And thanks for the chance to win. Fabulous quilts and quilting.Great job and thanks for sharing! Nice to meet you. Beautiful quilts! Thanks for the chance to win those gorgeous fabrics. I enjoyed seeing your quilts. Great designs. Thanks for hosting the Alberta quilters. I look forward to meeting more. Thanks for the giveaway. 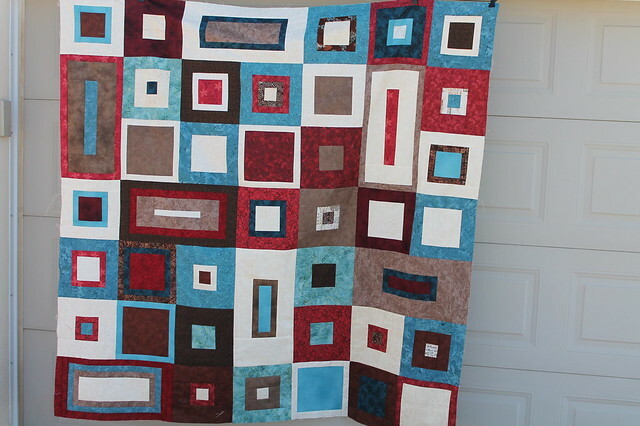 I really like the red/blue/brown square in a square quilt (the fourth picture) is there a pattern for it or did you design it yourself? Thanks for the giveaway. Lovely quilts! Thanks for sharing and for the giveaway. I love seeing what you are doing! Your quilts and quilting is inspiring. I love the grey/pink one on the weathered grey rail. Beautiful quilts. Thanks for the chance to win! Your quilts are beautiful, nice to meet you on line at least. That is a lovely bundle, thank you for the chance to win. Love the graphic design of your quilts, great job. Hi, this is my first time at your blog as I'm doing the blogathon. I'm so happy to see all your beautiful quilts and patterns. Your color choices are beautiful too. I'm from Montreal and will definitely be back to visit again, thanks so much for sharing. beautiful quilts! i love the clean lines! 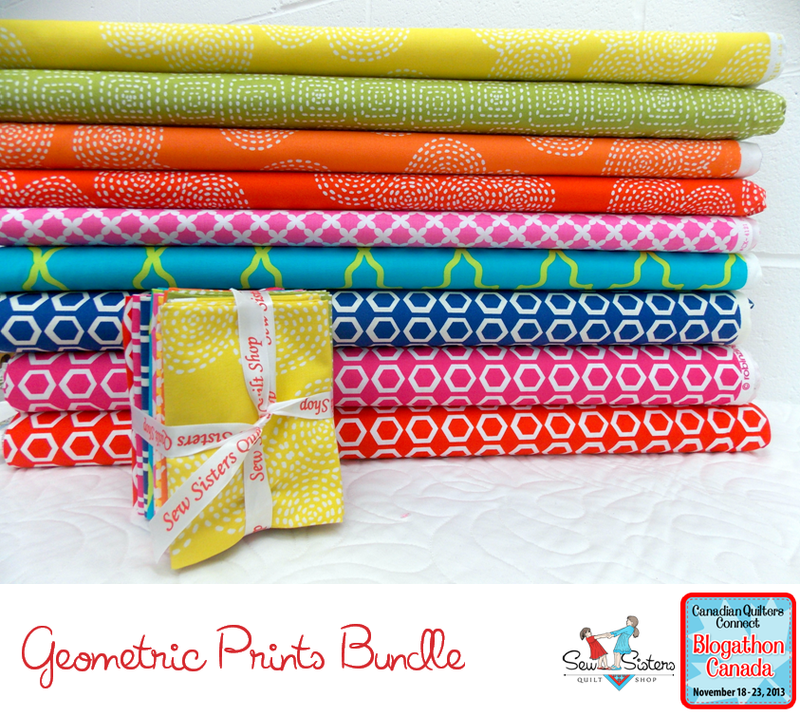 :) also great fabric bundle! What fabulous quilts - I love your style! Your quilts are wonderful and your long arm quilting is stunning. I love reading about fellow Canadian quilters, especially modern ones -- they can be hard to find! What a great giveaway bundle you choose. You've definitely got a defined style in your quilting - it's always nice to see such a strong viewpoint come across in quilts. Your long arm quilting is amazing. Beautiful quilts and a lovely bundle you have to give away! I don't think of Calgary as a cowboy town at all (but maybe that's because I've got some family there). It is great to 'meet' all of these fellow Alberta quilters (and other Canadian quilters too). Thanks for hosting. Love your simple and modern flare. And the quilting is just fantastic - something I am saving pennies for is a long arm. Thank you so much for sharing and hosting and I am off to visit those on the list. Hello from Eastern Ontario! I enjoyed your blog post and your quilts are gorgeous. Love the choice of fabrics and colours! Thank you for the generous giveaway! I love geometric shapes, and I think as much as you like rectangles, I like triangles. That said, I also love the hexagons in the fabric you've chosen to give away. your patterns and quilting is amazing and you deserve all the accolades and pats on the back. Wow this bundle of fabrics is so cheery. Your work is really beautiful and your quilting is gorgeous. That yellow and gray quilt stole my heart. Love your quilts with the extensive quilting. The quilting is so effective. Thanks for sharing. I love both your piecing and quilting. What type of long arm are you using....I am the process of shopping for one myself. Your quilts are all beautiful. I also love simple clean lines in quilts. You are very talented. Great to learn a little more about you. Thanks for the chance to win! Thanks for co-hosting today Andrea and introducing me to your beautiful work. Love your work, I also love clean geometrical lines . 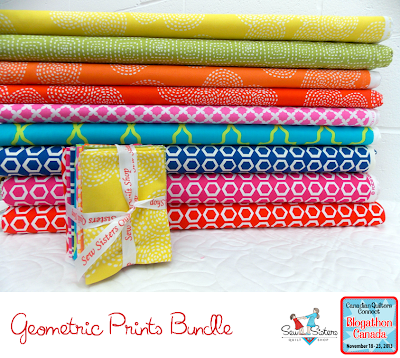 Great choice of bundle - gorgeous fabrics. I have so enjoyed this blog hop. Your quilts are beautiful. Thanks for the giveaway! Beautiful quilts. Love the colours in the giveaway. Gorgeous bundle of fabric. It is making me drool. Thanks for hosting a giveaway. Good morning from the frozen north of the Yukon!!! Your quilting is beautiful, so fresh and inviting. And I like that collection of fabrics you've chosen for your giveaway, very cheery. Gorgeous projects Andrea! As another blogathon host, this isn't a prize entry for me but I wanted to stop by and check out your post anyways. You do beautiful long arm quilting! Beautiful quilting! You are really doing some exceptional work. Thanks for the giveaway. Your quilts are fabulous, and I'm in awe of your quilting! Looks like you're having great fun with the longarm. Absolutely love your quilts and blog-keep up the good work! What lovely work you've done and I am blown away by your productivity! It's great to find another blogger to follow! Hi Andrea! I love your quilts and your quilting looks amazing too! It's great to see you embrace the cold of Alberta, lol. Just another good reason to keep making quilts, right? Beautiful quilts!!! Clean lines and great selection of pattern and colours. 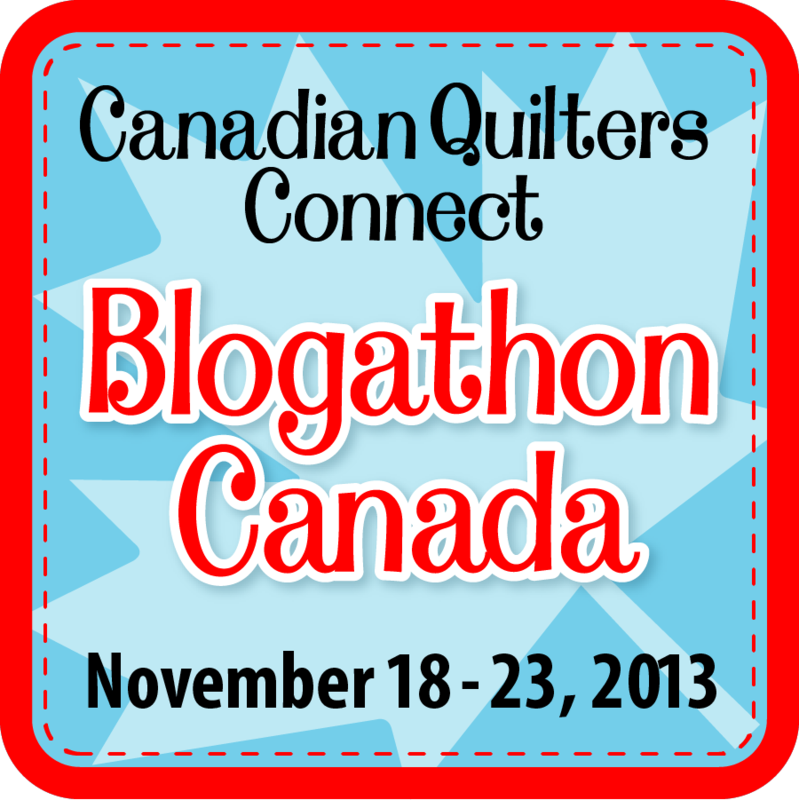 Thanks for being part of Blogathon, what a great way for me to find your blog! So enjoying this blog..have to write all the ones down to check out thoroughly. Thanks for sharing your beautiful quilts! Love these fabrics - so pretty and vibrant and 'clean'! Great photo gallery of your quilts. You've inspired me to try a modern quilt! I love your quilt with the minky on the back. It's totally cuddle worthy! Your quilting is just super. Thank you for participating in the blogathon. I am learning so much. lovely work! thanks for taking part! Fabulous quilting and congrats on the longarm, I have given it a try myself but due to my Rheumatoid, I will have to leave all that up to the artist.. I love the clean lines and this is inspiring to me. Your quilts are all so beautiful. Thanks for the giveaway and the chance to win that lovely fabric! Really wonderful quilts. Thanks for showing them. Love, love, love your quilts! HELLO, your quilts are beautiful! Lovely to meet you. Your quilting is amazing! Thanks for participating in this hop. Your quilts are awesome! So glad to have found you in the hop. love all your beautiful quilts and the quilting. I am from southern Alberta also, and it sure is winter here. time for these lovely quilts to adorn our beds to keep us warm. thanks for the chance to win. Love what you are designing and the fabrics you have selected for the give-away. So nice to see some of your modern quilts. I'm entering to hopefully win one of the giveaways, keeping my fingers crossed. I am loving your blog and have signed on to become a regular follower. Thanks so much for the wonderful give-away. Absolutely love this blogathon. It is so wonderful to see what my fellow Canadian's are up to. Love your modern designs, thanks for being a part of this. what fun happy fabrics! I love your quilts. I too like clean modern looking styles, and these fabrics would be great to use for any of them! I HAVE QUIT ENVY! You might be a bit shy posting about yourself, but I am sure glad you do. I look forward to seeing what your creative mind comes up with. So glad you were asked to join in. I love your quilting, designs and colours. Such beautiful work. The geometric materials would be great to add to my stash. What beautiful quilts and your FMQ work is fabulous. Thanks for letting me visit and read about your quilts. How wonderful to have a chance at the bright bundle! Your work is all so beautiful. Thanks for sharing. Fun bundle! Inspirational quilts, too. Thanks for sharing! Amazing craftsmanship. Thanks for sharing your passion. Wow! That's a lovely stack of fabric. Have to check out your blog. And yes, Alberta is pretty awesome. I live just 2 hours north of Edmonton. The fabric looks lovely! Thank you for the opportunity to win the bundle. I really love the quilts you've made too. What absolutely stunning quilts and very unique. You represent Alberta well. Hello from Nova Scotia. Hi from BC. I really love the examples of your quilting that you've shown here. Thank you so much for the tour of your quilts. Hi! from a fellow Albertan :) I love the bright colours in the fabrics you chose for the giveaway. You have beautiful quilts and lovely blog. Thanks for being part of the hop. I would love to be in the drawing for you nice gift. Thanks. Your quilts are all gorgeous! And your giveaway is fabulous - what a great groups of prints! your colors and simplicity are just like me... so many ideas running thru my mind after seeing your work! 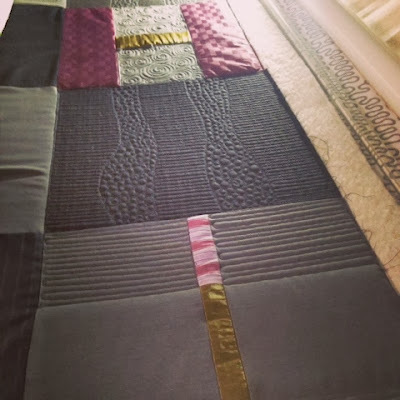 I love your quilts and I'm interested in your journey as a longarm quilter. I've just gotten a longarm and am leaning myself. Thanks for sharing and for the chance to win. Fun bright colours! Thanks for sharing! Beautiful quilts and your long arm quilting is really gorgeous. Thanks for sharing with us and hosting this giveaway. The fabrics are fantastic! What great prints. And your long arm quilting is beautiful. I lived in Calgary for a bit of my childhood (Ontario for the rest), and I really do miss being out there. You are right, it is a great city. Calgary IS a great city! Love your quilts and your long arm quilting is fabulous!! Thanks for counting me in for the wonderful giveaway!! Your quilts are beautiful, & your quilting is too. Love the texture that the dense quilting creates. I may try it myself on a smaller project. Your quilts look great, and how lucky you are to be able to long arm quilt!! I will be adding you to my bloglovin list!! I just love your work! I'm a fine of nice clean lines too. You have such an eye for colour & design. Thanks so much for a chance at the give-away. I am really glad you were asked to host today. I always enjoy your blogging and your quilting. 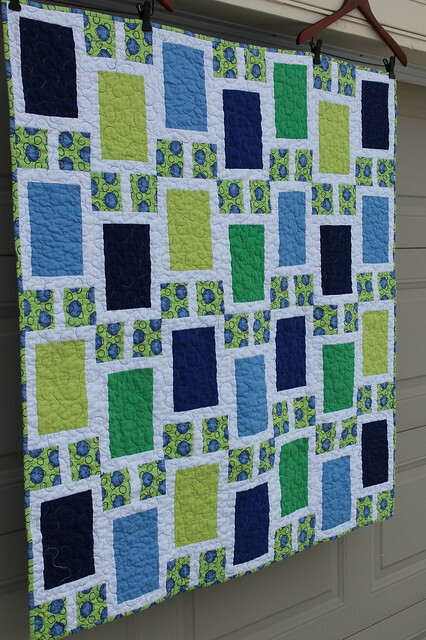 Today my favorite piece is the blue, green, navy and white quilt. Love lean towards clean lines. Enjoy doodling with your longarm. Looooove those graphics! Thanks for this great opportunity to meet more Canadian quilters, and to win a great gift! Love your work and your blog. Thanks for the chance to win some great fabric! I have enjoyed reading your blog and watching your journey over the years. Thanks for the giveaway. 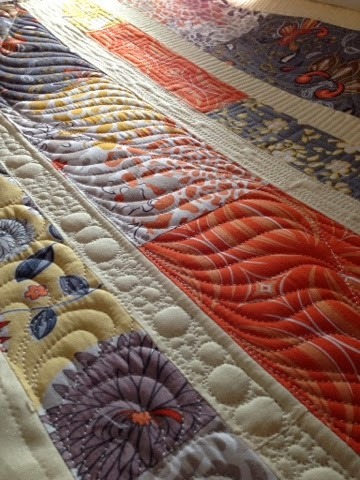 Oh your longarm quilting is just gorgeous! It gives me a goal, I'd love to be able to turn out lovely quilts and make them even better with the quilting. Thank you for the giveaway! i want to be like you when i grow up, lol, seriously i'm fairly new (2 yrs) to quilting but already i know i want to always quilt lots of texture into my quilts and dream of a longarm. I really like your grey rectangle quilt. Would like to make it. That fabric giveaway is great, need those yellow orange and greens for a project I am starting. Thanks. I am so enjoying meeting all these amazing quilters. Thanks for the chance to win! I really like your quilts. Visually interesting but not overwhelmingly busy. The first larger quilt I ever made was from your pattern on Moda Bake Shop and it's still on our bed but falling apart as I didn't put it together very well back then. Your taste is inspirational and it's fantastic to find a fellow Canadian. Thank you for the list of Canadian bloggers - I will be following all of them. I love your graphic modern quilts - the gray and black one near the top is stunning. I'm off to explore the other Albertan quilters' blogs. Visiting from the East Coast! 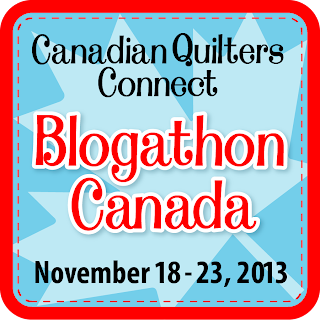 It has been amazing being a host on this blogathon :) I am going to be a new follower of yours - amazing quilts! I'm in love with your quilts....so beautiful! Thanks for the chance to win! You make many lovely quilts. I love your color palettes. Your quilts are beautiful. Love the simple lines and the bright colors. The give away is awesome, would love to win it. OMG....these fabrics are GORGEOUS!!! This would be my dream win, and I thank you for the chance !!!!!! 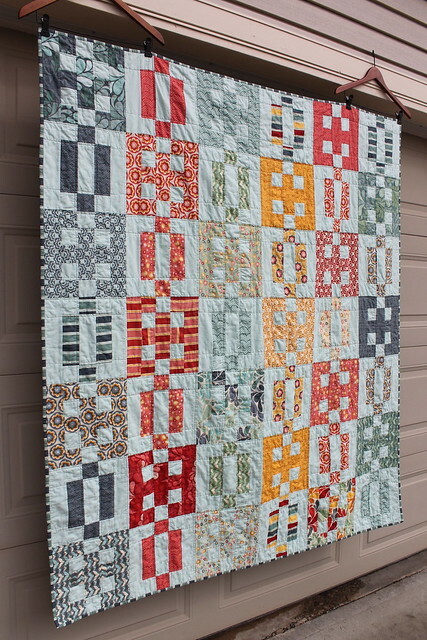 Thanks for these great new-to-me Alberta quilt blog links. Loved reading through them all. Greetings from central Canada. wow, you have an amazing number of comments! Nice to see examples of your work. My husband has traveled to Calgary for business and he loved it! (We live in Texas.) I really like your quilts and appreciate that you have free tutorials on your blog. Oh, I love your quilts! I had a friend that lived in Calgary and all I could remember about it is the COLD. :-). Thanks for a chance to win the gorgeous giveaway fabrics. you have a great eye for colour. looking forward to checking out your tutorials. I'm glad to have you added to my blog feed; love your graphic quilts. I'm partial to them too. Thanks for hosting, can't wait to see more of your blog. Your quilting is gorgeous! Thank you for the giveaway! Those are cute prints! And your quilting is awesome. Thanks for hosting the giveaway! Love the designs of your quilts. Your quilting is awesome. Hi there, thanks for holding this giveaway. I love geometrics and the colors are singing to me this evening. Happy November to you; one of my best sisters lives in Ontario. Love blog hops as I get to find new bloggers. Thanks for the chance at the great fabrics and I am now a follower. Hi Andrea! Nice to meet you, eh! Love your quilts and your style! Hi Andrea. I love your quilts - and I loved Calgary when I visited there last year! Thank you for the chance to win such great fabrics. Your quilts are truly gorgeous! Hello from Vancouver BC. I'm feeling a little bit wanty about winning the geometrics! Love your quilts and the clean lines within in them. I can see a lot of you in that packet of geometrics that you chose as your giveaway. Now I'm off to poke around some. 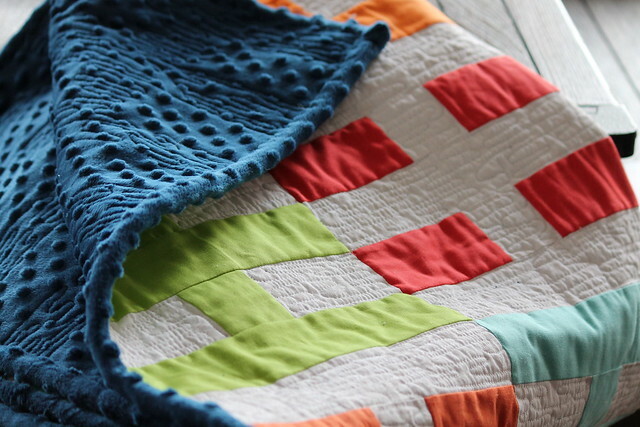 Lovely blog, and gorgeous quilts. Spectacular quilts! I enjoyed looking at your blog and will be back. Thanks for the opportunity to add to my stash. Andrea, I love the geometrics of your quilts. The giveaway stack to so appropriate to your quilts; thank you! Wonderful quilts and a fabulous stack of giveaway fabric! What wonderful quilts you have made! Thanks for the chance to win the giveaway. What a talented lady - I'm a beginner in quilting but love your designs - and the prize is so colourful! I am just beginning my quilting journey and its great to see your lovely work and ideas. Thank you. Love your quilts! I also love your posts on your starting your longarm journey. A Millie will be joining my household in January and I am picking up valuable advice from you! Thank you! That is such a lovely grouping of colour! I just Love to watch pictures of "creative" quilting - I'm usually stuck with straight lines, because I just can't do much more yet. How very humbling to take a walk through your blog Andrea. Your quilts are amazing. I love your fabric choices! The fact that you designed them yourself is even more amazing, and being a terrible free motion quilter (me I mean) I am in awe of your quilting. Thank you so much, from Prince Edward Island! You do stunning work! You are one talented woman. Thank you so much for sharing. What a beautiful bundle and a beautiful blog. I'm off to do more exploring. Such pretty colours.Am enjoying this hop. Great blog and wonderful giveaway!!! Lovely quilts! Fun to see the new blogs. Beautiful fabric and I like the clean lines as well. I wish I could afford a long arm machine and had the room for one. Love to sew though. I am just getting into quilting. I'm a day late, but thrilled to have come across your beautiful blog! Enjoyed seeing your quilts! Great giveaway on this fun blog hop... thanks for the chance to win! Love your quilts. It's amazing what you can create from rectangles. That's an incredible cheerful bundle! Your quilts are gorgeous! I'm a new longarmer too! Love your designs. Your longarm quilting is beautiful! I like how you've varied the texture from one section of the quilt to another. Very creative! Your quilt with Minky is amazing. That fabric drives me insane. Thanks for showing us your wonderful quilts. I'm so glad I discovered this Blogathon! Your quilts are great! Thanks for the chance to win! Great post! And bright geometrics are my favourite kind of fabrics - thank you for the giveaway! I love the photos of the quilts you shared. They're GORGEOUS! And I love the beautiful, bright, geometric prints for the give-away. I love the bright colors! Thanks for the offering!